These sour cream chicken enchiladas are the best enchiladas I have ever eaten. Tortillas filled with chicken, scallions and cheese and topped with a rich and creamy sour cream and tomato sauce. 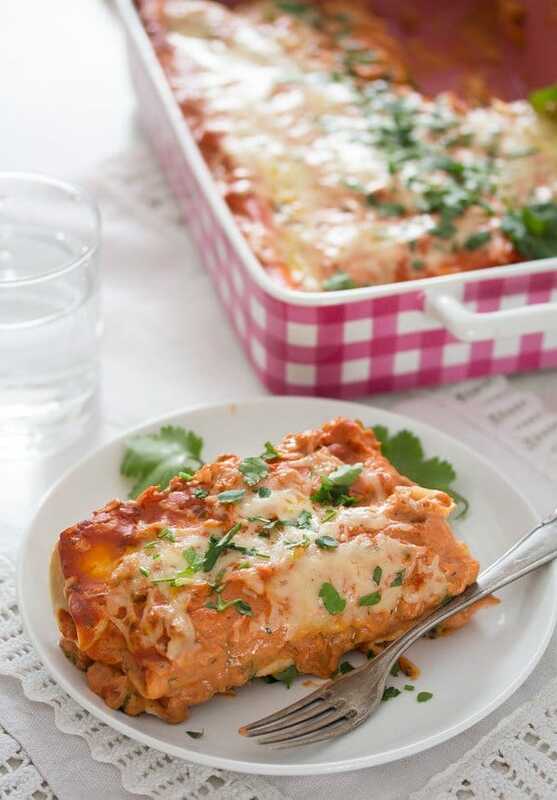 And to make things even better this easy chicken enchilada recipe is ready in less than half an hour. Although Mexican food is a rather new thing for us, I have been cooking quite a lot of Mexican food during the last year or so. From Mexican soups to refried beans, tostadas, tacos and quesadillas. And I have even made a cake, the famous tres leches cake. No wonder, Mexican food is amazing, once you get to know it just a little bit, you can’t go back. And another reason for me cooking so much Mexican food lately is my kids watching some children series on Netflix, where apparently people eat nothing else than tacos and enchiladas… So, they keep asking me for them as well. But what can I say about these particular sour cream chicken enchiladas? They are soooooooooooo goooooooooooood! 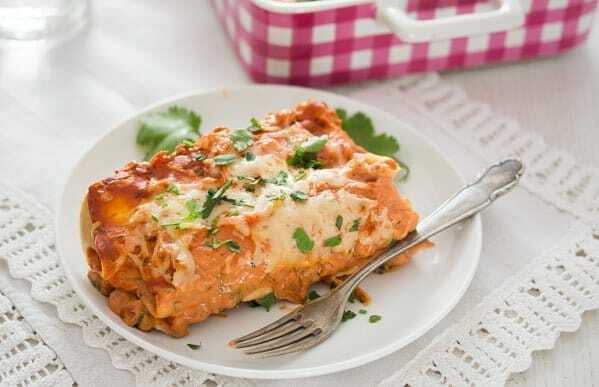 I have made enchiladas before – black beans, ground beef, vegetables – and even a chicken enchilada recipe as well. It was good, but it was nothing compared to these Mexican sour cream enchiladas. The recipe I had used before was pretty elaborate, it took a much longer time to cook and it used much more ingredients, thus being more expensive than these sour cream chicken enchiladas. 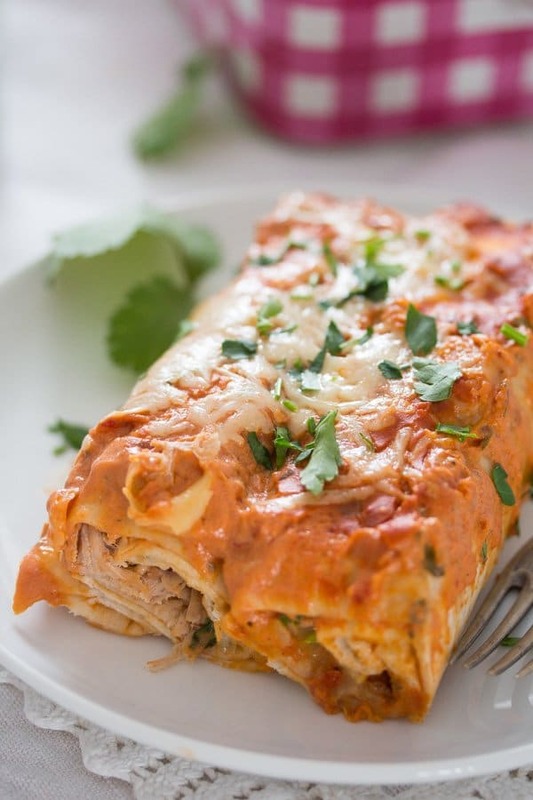 And then came this easy chicken enchilada recipe! So delicious! There is nothing I would change about it, it is just perfect the way it is. And so easy to make! And so quick! And so cheap! And everybody loved it so much: me, the husband, the kids, the friends. 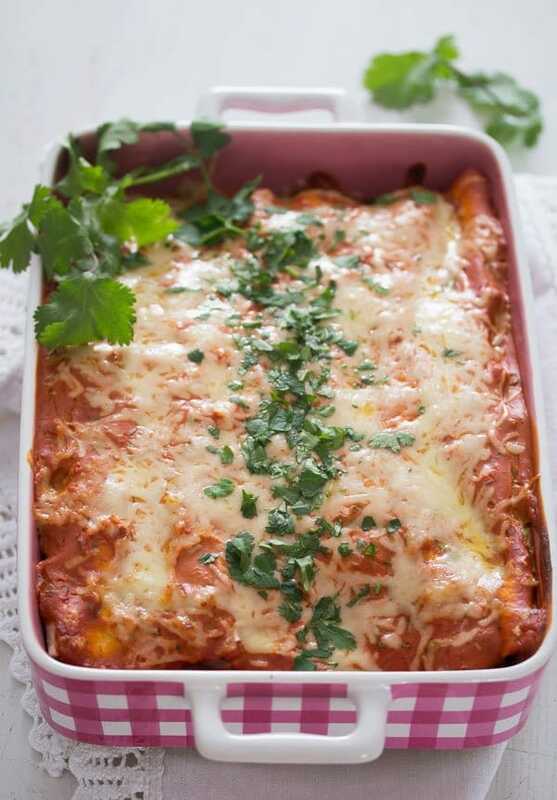 Those comforting chicken and cheese filled tortillas, baked in that creamy and slightly tangy sour cream and tomato sauce and topped with more cheese… You will love this recipe! 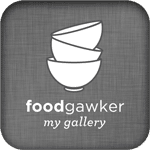 A wonderful read for somebody like me, who just loves collecting and reading cookbooks, but pretty much a useless cookbook if you live in Europe and you don’t want to order over priced ingredients online. I got through the entire book and I have only found a handful of recipes that I could actually cook, too many ingredients I have never even heard of, special equipment needed and so on. Not to worry, if you live in America, you will love this book and will actually be able to cook lots of recipes out of it. But then I found the recipe for these simple enchiladas in sour cream sauce and I had to make them, I was so happy about the “normal” ingredient list. However, I have changed the recipe to make it even simpler. First of all I use bought tortillas, they are so convenient and we all like them a lot, I’ve added some ingredients to the sauce and filled the tortillas with already cooked chicken, scallions and cheese instead of eggs and regular onions. But I am sure I will try the egg version of these sour cream enchiladas as well, it sounds delicious! Step 1: Make the tomato sauce. Cook the finely chop onion in olive oil, add the garlic, blended tomatoes and spices and cook the sauce for 5 minutes. Adjust the taste and let cool for another 5 minutes. Stir in the sour cream, fresh herbs and adjust the taste. Step 2: Warm the tortillas in a large pan without the addition of any fat. Heat the tortillas only for a few seconds on each side, only as long as they need to become softer and more pliable. I had 6 large tortillas with a diameter of 25 cm/ 10 inches. If your tortillas are smaller, use more. Step 3: In the meantime prepare the rest of the ingredients. I used already cooked chicken thighs leftover from making a soup. You can use poached chicken breast instead or leftover roasted chicken or rotisserie chicken. Shred the chicken with your hands. Finely slice the scallions/ green onions. Finely grate the cheese. I used Cheddar cheese, but you could use some Mexican cheese, if available. Step 4: Give 2-3 tablespoons of the enchilada sauce to a casserole dish. Smear each tortilla with about 1 tablespoon of the sauce. Divide the shredded chicken and the scallions between the tortillas. Sprinkle the filling with just a little bit of the grated cheese. Step 5: Roll the tortillas and give them to the casserole dish. Pour the remaining sauce all over the enchiladas and sprinkle the dish with the remaining grated cheese. Step 6: Bake the sour cream chicken enchiladas in the preheated oven (200 degrees Celsius/ 400 degrees Fahrenheit) for only 10 minutes. The cheese should be melted and the enchiladas should be heated through. Leave the enchiladas to rest for about 5 minutes, then serve immediately. For an easy, every day meal serve the sour cream chicken enchiladas with a green salad with vinaigrette or yogurt dressing. If you want to make a more elaborate Mexican meal, serve the enchiladas with guacamole or avocado slices, salsa – something like this corn salsa, green salad or vegetable salad, grilled vegetables, refried beans. And Mexican rice. I have to admit I have never had rice with enchiladas myself, but that seems to be a very popular combination, I will keep it in mind for the next time I make enchiladas. Preheat the oven to 200 degrees Celsius/ 400 degrees Fahrenheit. Finely slice the onion. Heat the oil in a sauce pan and cook the onions for about 2 minutes or until translucent. Grate the garlic and add it to the pan together with the chili. Stir for one minute. 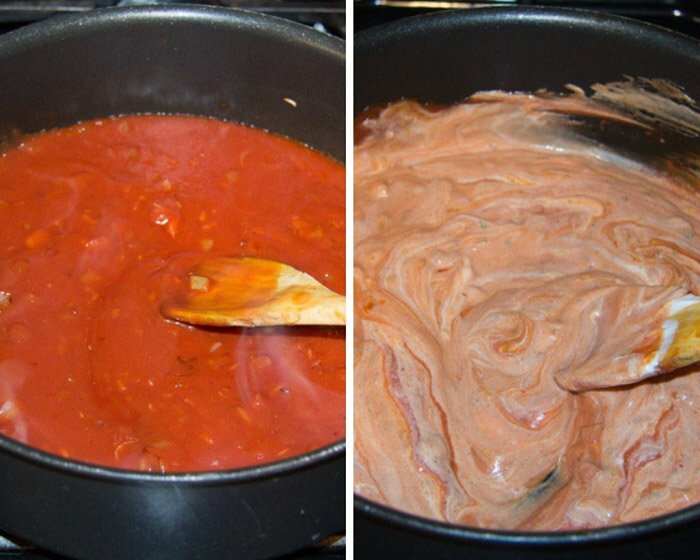 Blend the canned tomatoes in a blender or with an immersion blender. Give them to the pan, add the sugar, dried oregano and salt and cook on medium heat for 5 minutes. Cover the pan partially if it starts to splutter. Stir occasionally. Remove the tomato sauce from the heat and let cool for 5 minutes. Stir in the sour cream and the chopped coriander. In the meantime, shred the chicken and finely slice the scallions. Grate the cheese. Heat a large pan without adding any oil. Give one tortilla at a time in the pan and heat it until softer and pliable, about 10 seconds on each side. Repeat with the rest of the tortillas. 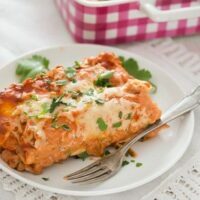 Give 2-3 tablespoons of the tomato and sour cream sauce to a casserole dish of about 25x20 cm/ 10x8 inches, the bottom of the pan should be covered with a thin layer of sauce. Smear each tortilla with about 1 tablespoon of the sauce. Divide the shredded chicken meat and the scallions between the tortillas. Sprinkle the filling with just a little bit of the grated cheese. 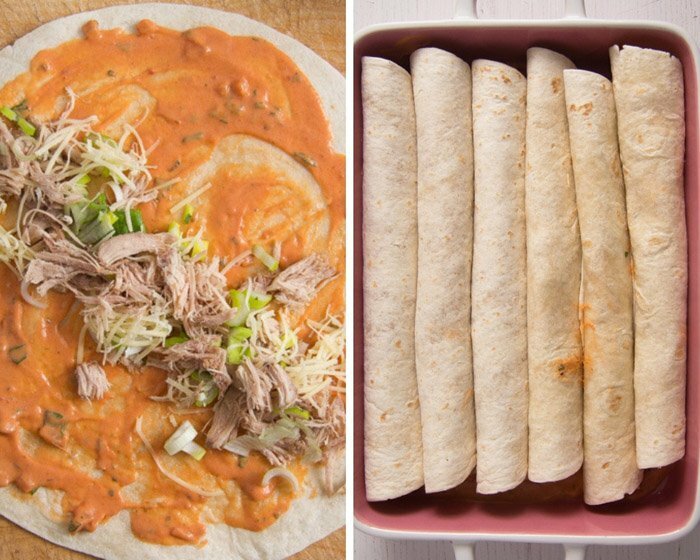 Roll the tortillas and give them to the casserole dish. Pour the remaining tomato and sour cream sauce all over the enchiladas and sprinkle everything with the remaining grated cheese. 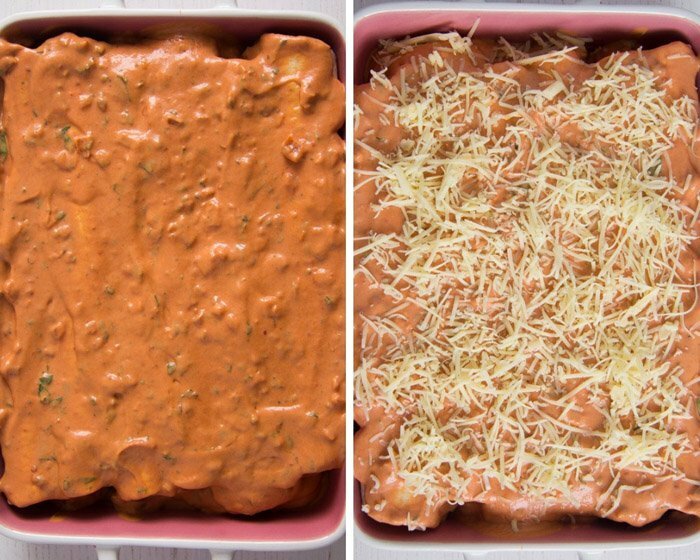 Bake the sour cream chicken enchiladas for only 10 minutes. The cheese should be melted and the enchiladas should be heated through. Leave the enchiladas to rest for about 5 minutes, then serve immediately as suggested above. Note 1: You can use ground cayenne pepper or any other fresh or dried chili you like, just think to adjust the quantity according to your heat tolerance. Note 2: The tortillas have a diameter of 25 cm/ 10 inches. If using smaller tortillas, you will need more. Note 3: I used leftover chicken from making chicken stock. You can use any kind of leftover chicken (roasted, rotisserie) or poach about 200 g/ 7 oz chicken breast. Leftover turkey works as well. Note 4: Cheddar works perfectly, but it can be replaced with a suitable sort of Mexican cheese. That looks super mouthwatering! Only if my husband ate cheese..sighs.. 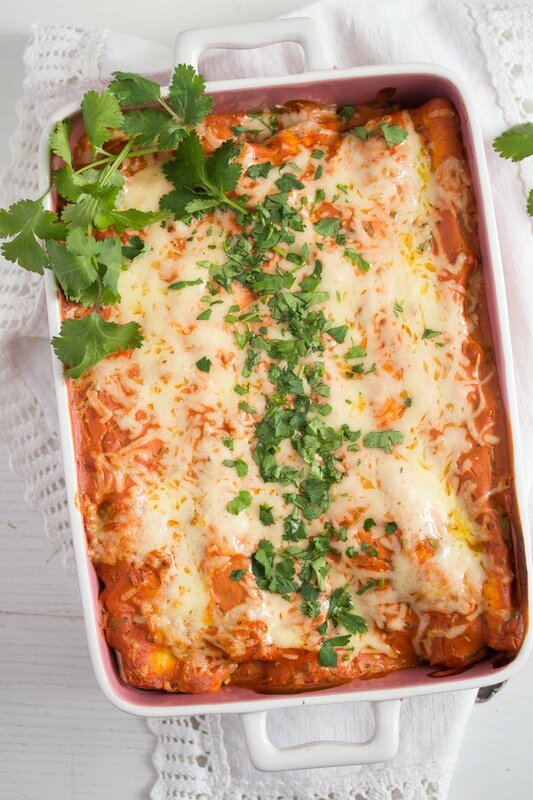 There are very few dishes that are more comforting that a batch of enchiladas. I could eat them every day. 🙂 Yours look fabulous!!! 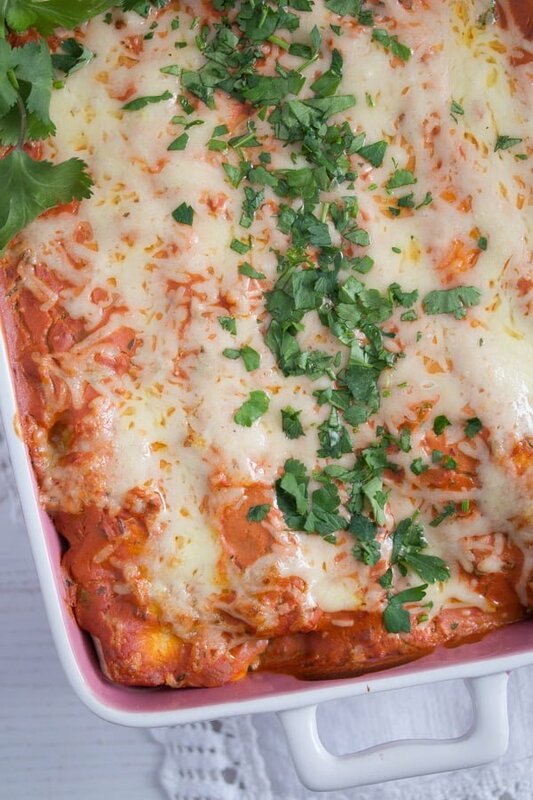 Adina, these enchiladas look fabulous! Love the sour cream sauce. We eat lots of Mexican food. It’s so tasty!